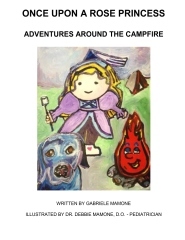 Book two of a series is written by Gabriele Mamone with collaboration from her mother, a pediatrician- here, Jasmine’s fur-friends from around the world gather up at a campfire to teach Princess Jasmine more lessons about how to deal with some common fears and phobias such as swimming and thunder. Other topics include adoption and overcoming disabilities such as being in a wheelchair. All proceeds go to Canines for Disabled Kids without any monetary gain to the authors and editors. Gabriele Mamone is an undergraduate student at the University of South Florida in Tampa. Gabriele is seeking to earn her bachelors degrees in psychology and behavioral healthcare. She plans on continuing to graduate school where she will earn her PsyD or PhD in psychology. She one day hopes to work with children and open up her own office. Dr. Debbie Mamone is mother to Gabriele Mamone. Dr. Debbie is a pediatrician who authored and illustrated the first book titled Once Upon a Rose Princess. Dr. Debbie worked collaboratively with Gabriele on this second book to the series titled Once Upon a Rose Princess: Adventures Around the Campfire. All of the illustrations were beautifully painted by her in her spare time.